If you’ve ever wondered, why there aren’t enough exciting new fine-dining places to dine at in Kuala Lumpur, join the club. I mean KL has its great restaurants and we all have our favourites, but it has been a while since I’ve been really excited or thrilled by a particular dining experience, that is until I found Five Sen5es at the Westin, Kuala Lumpur. Five Sen5es is a contemporary Cantonese restaurant which serves both traditional as well as more innovative Chinese cuisine. Their newly revamped restaurant is chic and cool. 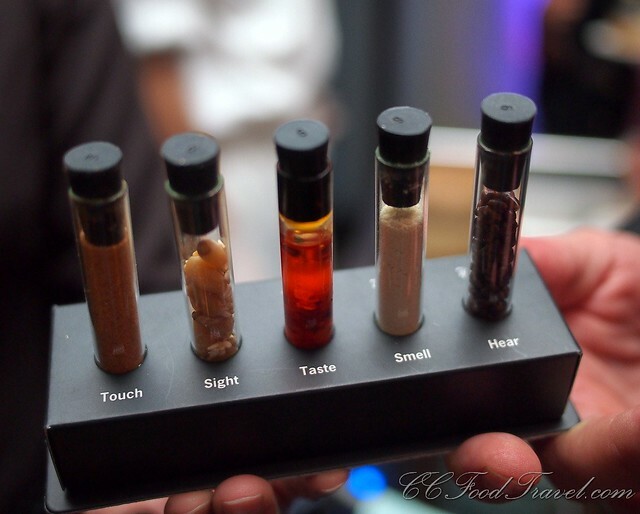 The most exciting thing about Five Sen5es is their latest ala carte menu which emphasizes the five human sen5es of Sight, Taste, Scent, Touch and Sound. The presence of these five elements is evident in the preparation, cooking and presentation of these five spectacular signature dishes. You can pick and choose which elements you want to experience, and here’s a preview of what to expect if you indulge in this exciting, sensory-centric menu. We should start with sense of sight, because this was my favourite station. 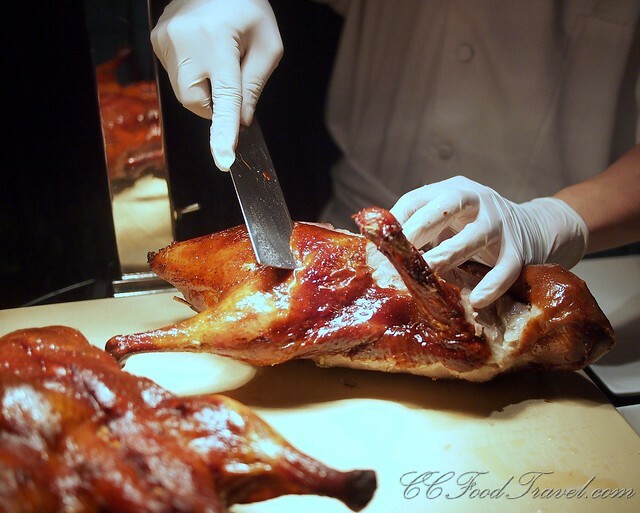 The incredibly crispy and delicious Traditional Peking Duck in Two Series. 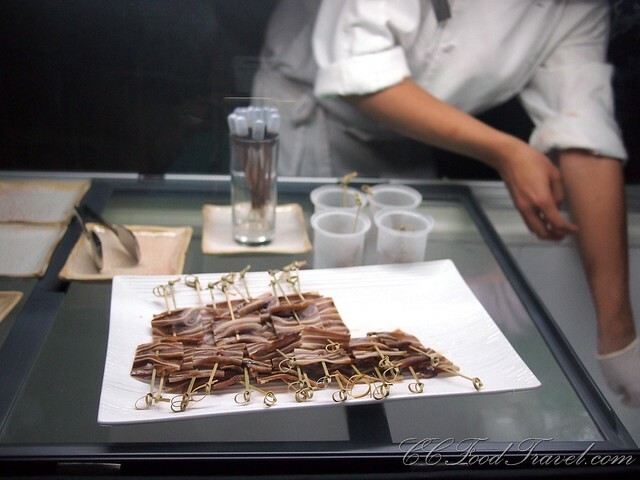 Once you see the crispy duck skin being flayed from the duck, it’s hard to not start salivating! 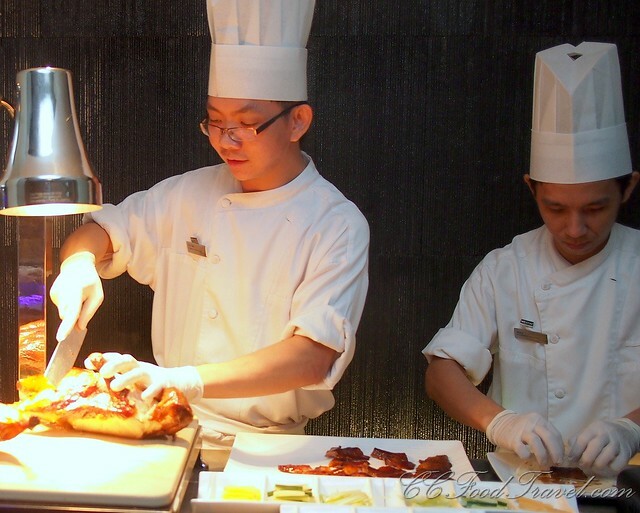 Peking duck is one of the most famous dishes from Beijing. The duck is traditionally carved in front of the diners and served in a few steps.The ones served at this restaurant come wrapped in Momo skin, spring onion, cucumber sticks and delicate Hoi sin sauce. The skin is super crispy and this really complements the soft and springy pancake skin to perfection. Seeing as you will be watching the Chefs prepare the meal – this dish falls under the category of Sight. In this section, we were blindfolded so that we would remove the visual stimulus from the experience, thus enhancing the sense of Taste. 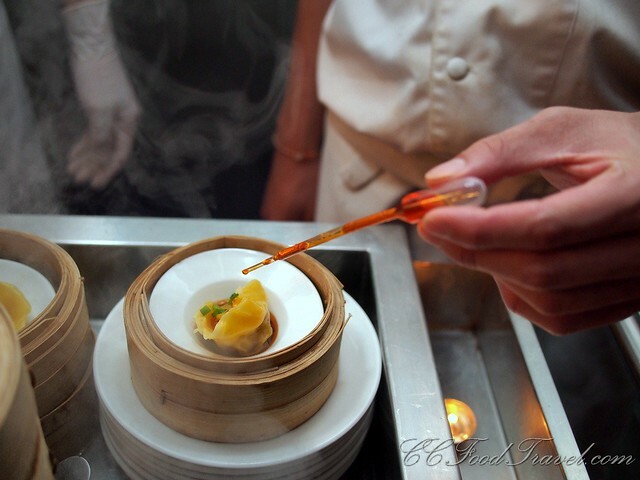 We were served a soup of Imperial Double Boiled Morel Broth, with Australian Scallop Wanton Dumpling. 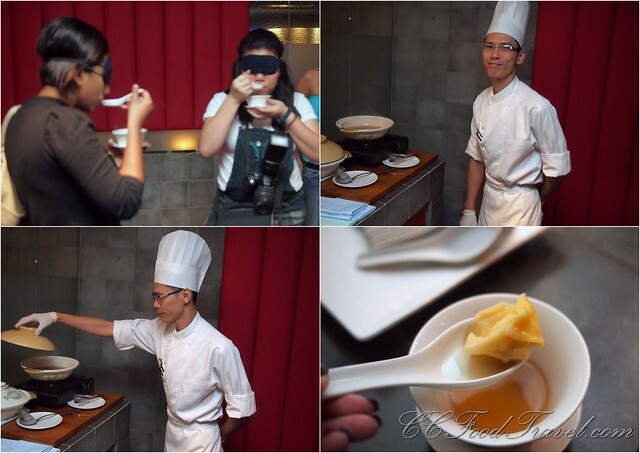 The chef created a delicious Imperial broth which included French Morel mushrooms and vegetables – earthy and rich, this soup’s flavour really shone through even our blindfolds! A pretty fun experience. In fact, just for fun, the next time you have food you need to taste, soup for example, I challenge you to blindfold yourself and see if you can make out the ingredients in that mouthful – you will actually notice more nuances in flavours and textures that you would not have otherwise noticed! 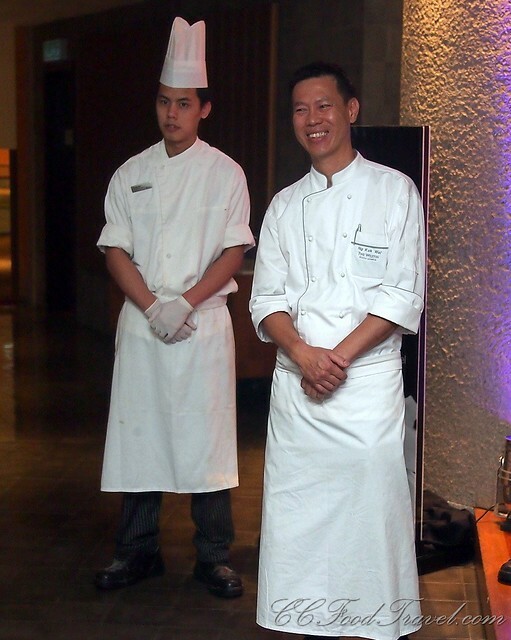 This smiling Chef told me, as I walked into the room.. just trust your nose.. what do you smell? As I walked around and the incense burners were lit and emitting some delightful scent, I realized that the scent that was in the air was truffle! 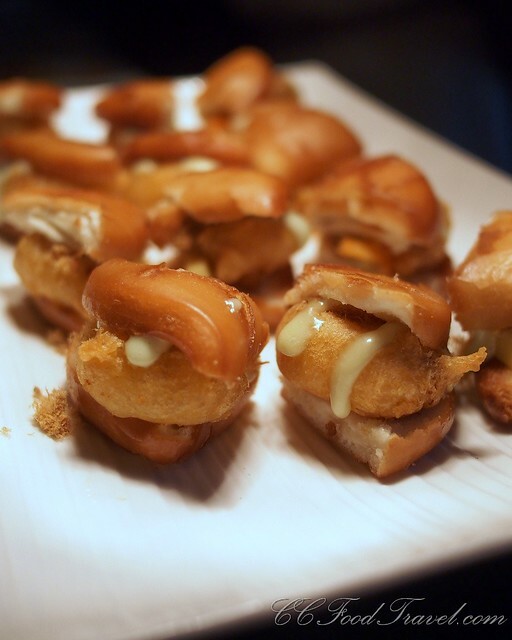 We were served pastry puffs of fried Seafood Silken Egg Mousse, Crispy Crème Brûlée and Truffle Oil. The truffle oil was added last with a squirt from the bottle. 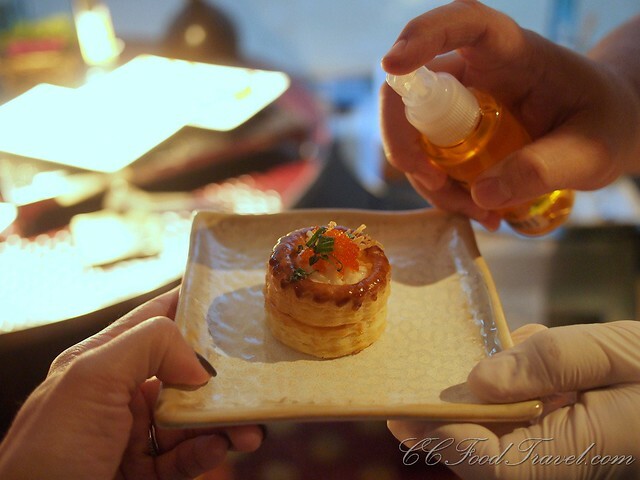 The flavours were good but I would have preferred less puff pastry – it detracted from the lovely ingredients! The truffle oil was however, a good match for the rich, wok-fried seafood and silken egg white and the combination with the crispy crème brûlée completed the ensemble nicely. How does one experience touch? With their hands of course. what does this mosaic pattern on sticks, look like? 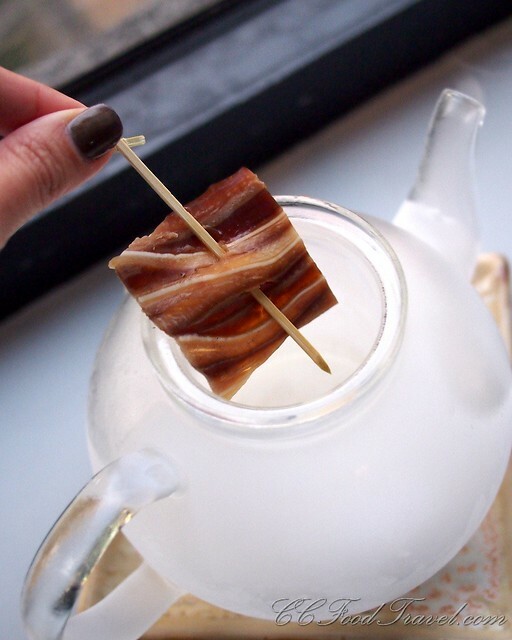 one of my favourite stations too – the pig’s ears! Last but not least, the sense of sound. It was hard to miss the sound of something sizzling on the hot plate, when we entered the final room. This Pan- Seared Stuffed Prawn with Enoki Mushroomsin Honey Maki Jus really made a loud and lasting impression! The tempting sound emitted from the searing pan certainly heightens the auditory sense for this final course. 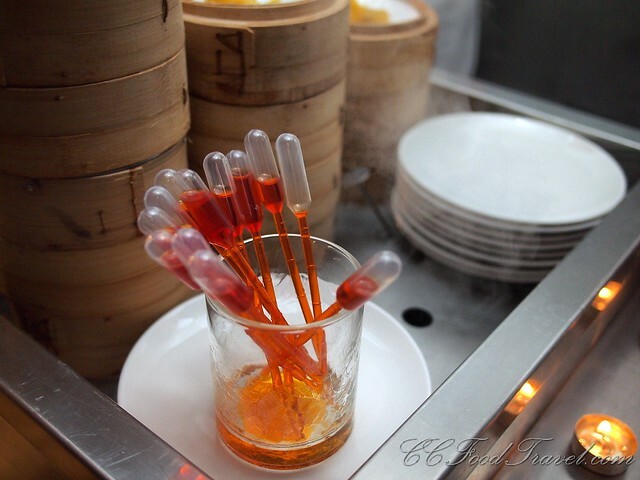 Apart from this incredibly innovative and creative way of ordering from the Ala Carte Menu, dinners will be happy to know that Five Sen5es also serves Dim Sum, prepared using the Five Human Sen5es. There’s the Simply Dim Sum Lunch All You Can Eat (weekdays) priced at RM 48++ per person which includes free flow of Chinese tea.. and then there’s the Simply Dim Sum Brunch (weekends), priced at RM 68++ per person which also includes free flow of Chinese tea. If you want other soft drinks, it’s chargeable. Wanton filled with shrimp and seafood to pork and vegetables, wrapped in fresh handmade wanton skins, served with Sichuan chilli oil dressing. The spicy and sweet sauce, is typical of what you might find in the Sichuan province. adding just a drop was enough for me, as I already found this dish so spicy! 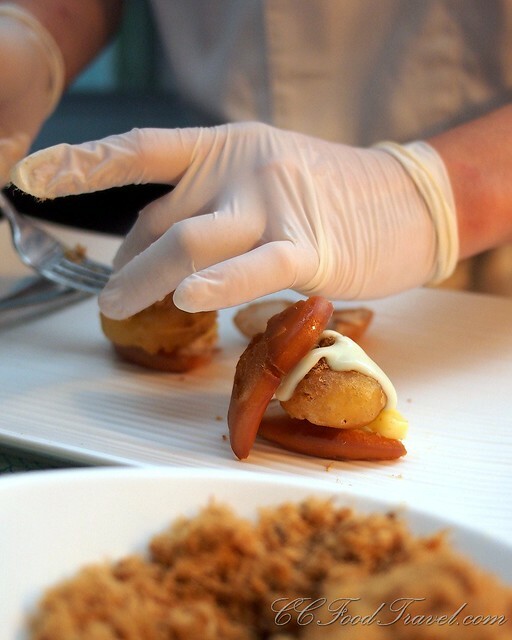 Deep-fried ‘man tau’ is used to wrap mango strips, chicken floss and wasabi lotion. 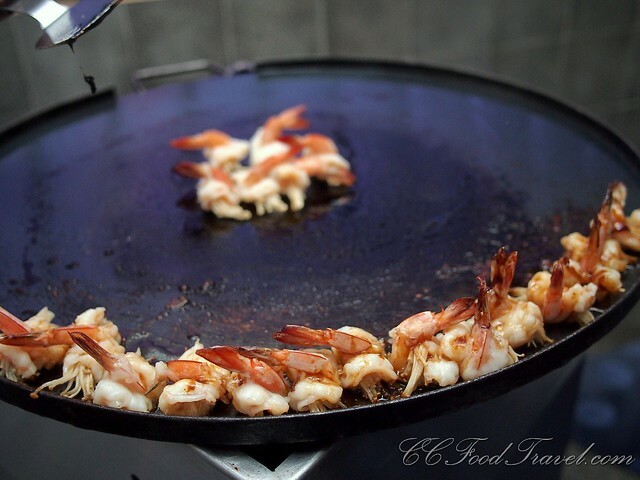 The deep-fried ‘man tau’ is not for the faint hearted – so crispy it could only mean one thing – deep fried in oil! Anyway the texture is crunchy on the outside, and it gives way to the soft and springy man tau interior. Addictive, but I personally would not eat too many of these! 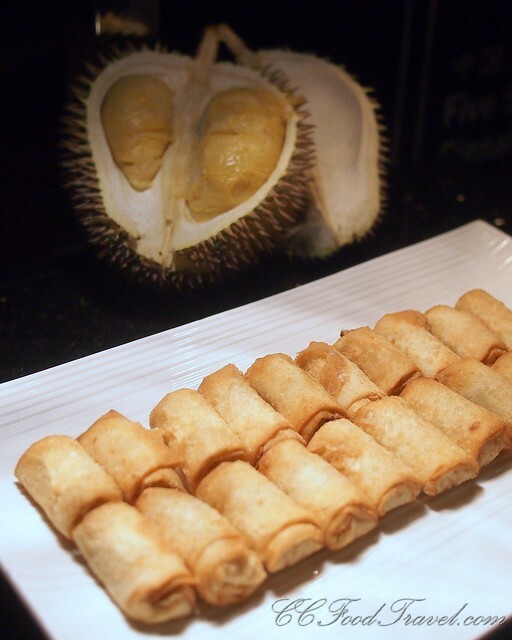 I myself did not eat this, as I do not like durian but I am told that it was good! The hot crunchy puffed crust is followed by the awesome contrasting difference in temperatures and the taste of the deliciously flavoured, smooth, rich durian ice cream! Eat it and weep! 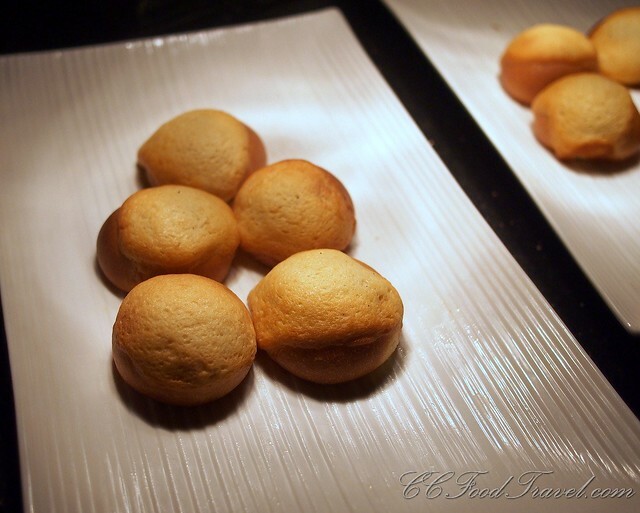 These were palm-sized, spherical, oven-baked traditional buns filled with homemade avocado cream. They really look like the chinese version of the roti boy! Tasty and creamy on the inside – these were hard to put down. 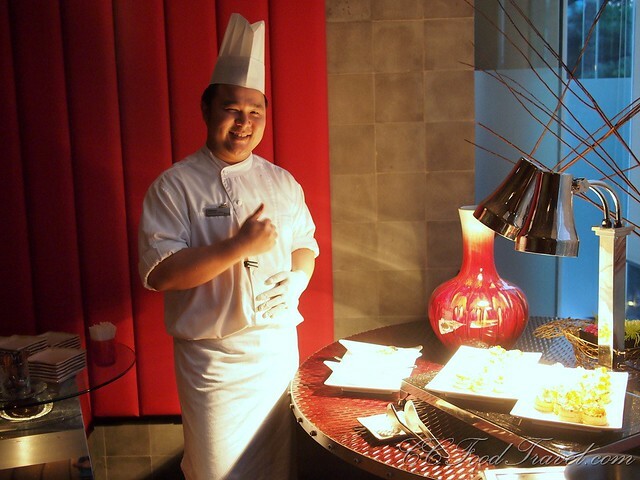 In case you were wondering, the man behind all these creative Chinese cuisine would be Chef Ng Kok Wai, who has had vast experience working in Hong Kong. 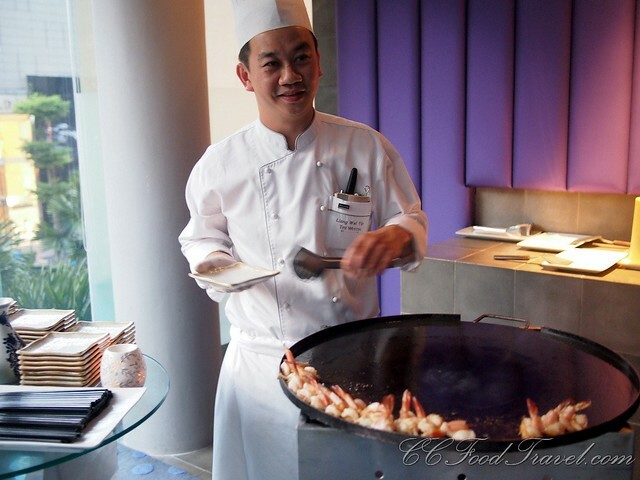 He began working when he was only 17 years old, and has had over 27 years working with the ultra-fussy Hong Kong tastebuds, so you know his Cantonese food and cooking technique is of excellent quality! 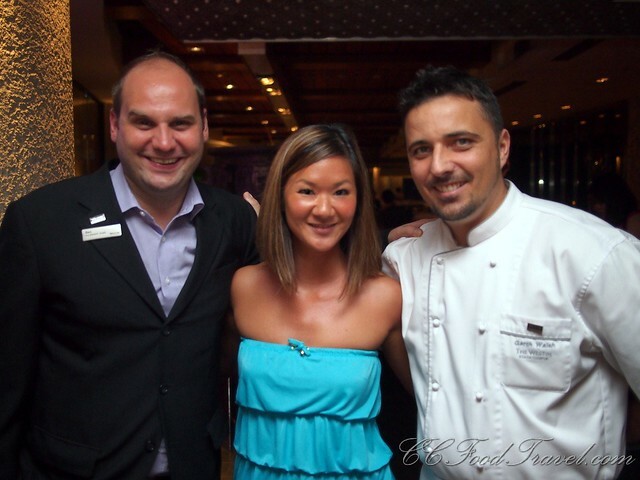 The Westin’s Manager Benjamin Zahn, Director of Kitchens at The Westin, Garth Welsh and ME! Anyway, I was pretty impressed with the culinary journey through the Five Sen5es, that I experienced at this 5 star restaurant at the Westin KL. I would highly recommend you check it out for yourselves. God knows it has been ages since we’ve been pleasently surprised in the Asian fine-dining department. The Westin Kuala Lumpur, 199, Jalan Bukit Bintang. dinner from 5.30pm to 10.30pm. 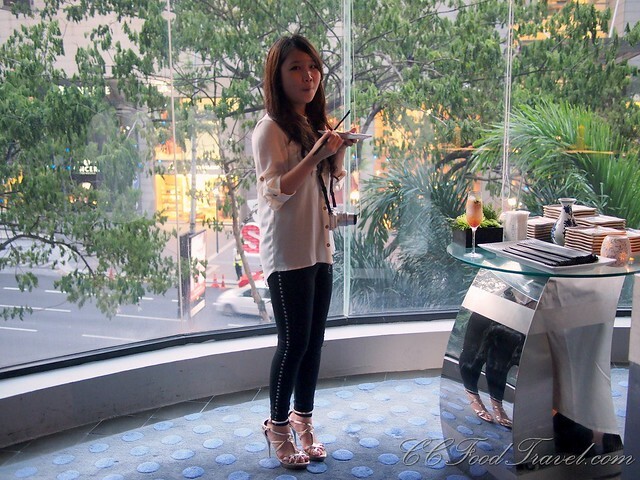 Thanks for showing my face in your blog. I miss the Pecking duck and the rubbery &springy prawns.. The Peking duck in Beijing is Fattier I agree, and less meat. Do check out Five Sen5es as the Beijing duck is more geared towards the Malaysian tastebuds – crispy with some meat and full of flavour. Not as fatty as the Peking duck in Beijing. One of the places we love to visit in Pudu, for some carbo loading, is this place we call, the “Pudu Chinese Indian Rice”….